As if taking a cue from one of his characters a dark secret from the past threatens to crash on the opening chapter of Milan Kundera’s life. 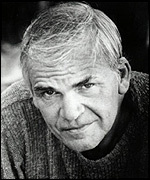 In October 2008, the Czech weekly Respekt published a story that claimed Kundera informed on one of his countrymen in 1950, leading to the man’s imprisonment for 14 years in a hard labour camp. The basis of the assertion was an old police report that fell into the hands of Adam Hradilek, a historian researching the bleak days of Czechoslovakia’s Communist past. The police document reopened the story of Miroslav Dvoracek and that of his childhood friend Iva Militka. The report also brought the past of arguably the most brilliant literary surgeon of communism in Eastern Europe to the forefront. It is a widely reported and misreported story in which the jury is still out on the truth and doubt remains the only certainty. In 1948 a putsch in Czechoslovakia led to a communist takeover. This resulted in the armed forces being purged and veteran airmen who had flown with the RAF in the war (about 40 per cent of Czech Air Force) were demoted, kicked out or sent to labour camps due to their exposure to the West. Even students were not spared. Two boyhood friends, Miroslav Dvoracek and Miroslav Juppa, who had attended the same school in a small town in Eastern Bohemia were included on a list of expulsions in a memorandum from January 1949. When they were ordered a month later to join an infantry unit, Dvoracek and Juppa, aided by Juppa’s girlfriend Iva Militka and her relatives fled to West Germany. Click on the headline to read the full story.